Dec (Jnow): +41 degrees 16' 38"
The Great Andromeda Galaxy is the most prominent member of our local group, which includes the large and small Magellanic Clouds, M33 (Pinwheel Galaxy), and the neighboring elliptical galaxies M110 and M32, seen above at 5 o'clock and 10 o'clock (just off center), respectively. This image represents a total 16 hours of exposure and is comprised of data from Luminance, Ha, and RGB filters (details below). The Ha signal is particularly interesting, since it highlights the bright HII regions most prominent in the outer galactic arms. HII emission in galaxies is most often due to excitation of surrounding hydrogen gas by UV irradiation emitted by newly-formed, young stars. That's why we see so much HII emission in our own galaxy in regions such as the Orion Nebula and in Cygnus, for instance. Notice how the HII emission in the above image corresponds to regions of blue star formation. The southwestern arm in the lower left contains a particularly active region of new star formation referred to as NGC 206, shown in this image by Rob Gendler. In my image, notice the absence of prominent HII emission in the two elliptical galaxies, M110 and M32, which contain old stars and lack regions of new star formation (it is possible that HII regions exist in these galaxies as well but are simply below the level of resolution in this image). M31, like most large spirals, is thought to contain a large, central black hole that consumes gas and nearby stars at a prodigious rate. The radiation emitted in the vicinity of black holes (due to extreme heating of matter as it flows into the region) compresses surrounding gas and most likely triggers a new wave of star formation in a disk surrounding the galactic center. In this regard, there is a rotating disk of about 400 blue stars that formed 200 million years ago and is rotating around the galactic center at an orbital velocity of 2.2 million miles per hour (the details may be found in Rob Gendler's excellent description of the M31 nucleus). Given the proximity of these star to the intense radiation emitted from the central black hole, it would be impossible for life as we know it to evolve around such stars. 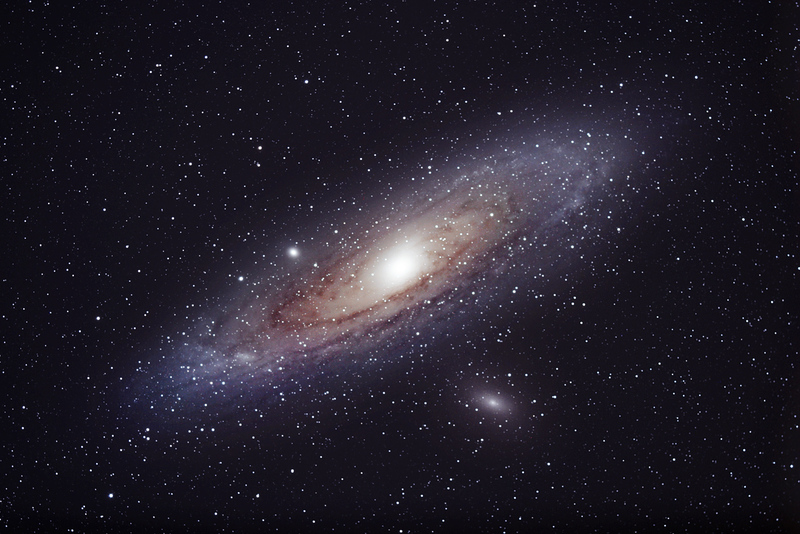 It is predictable that we exist in an outer arm of a spiral galaxy, where conditions are more favorable for life to evolve (i.e., the galactic habitable zone). 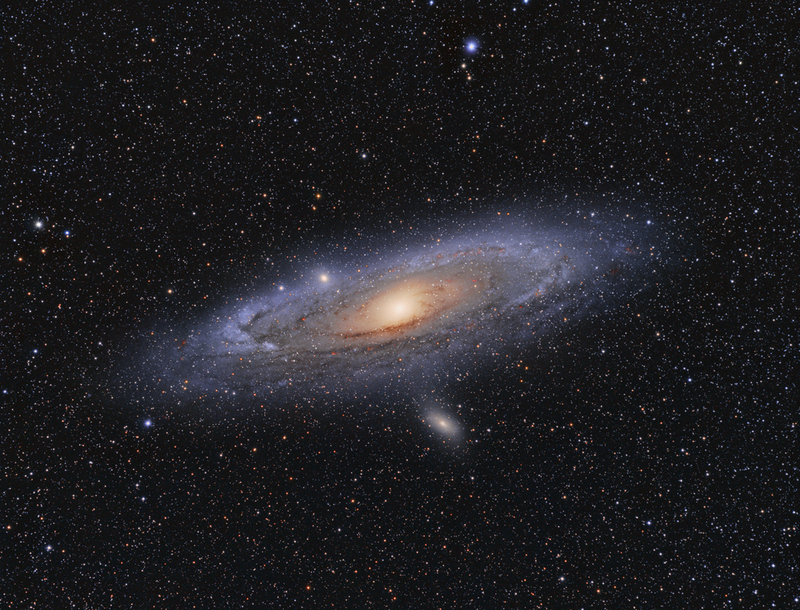 Perhaps intelligent lifeforms are pondering the same things about us, as they gaze at the Milky Way from their vantage point in one of the outer arms of M31. At a dark site, M31 is a naked eye object, although for city and suburban dwellers it's almost impossible to view without a telescope. The central portion glows slightly yellow as a result of older stars, whereas the periphery has a characteristic bluish hue due to a predominance of younger stars. Please check out the higher resolution links for more detail. Exposures: Ha, 4 hours; Lum, 4 hours, R, 3 hours; G, 2 hours; B, 3 hours, all unbinned. Total exposure 16 hours.